Finally, here is my trip report from my first liveaboard dive trip. The trip took place in May 2002. The destination was Barkley Sound on the west coast of Vancouver Island, British Columbia. The trip was arranged through my local dive shop so I knew 5 of the other divers before we left. The ship was the Nautilus Explorer owned and operated by Mike and Mary Anne Lever. She is a custom built 116ft expedition dive yacht designed for cold water diving. It seems that Mike thought of just about everything when he had this ship built. The layout is like this: Below deck there are 8 guest cabins and bunk space for 4 more divers. 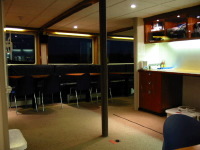 The main deck has the main salon where the dive briefing are held. There is plenty of sofa area for napping and lots of 120 volt outlets. This was handy for plugging in my Powerbook. 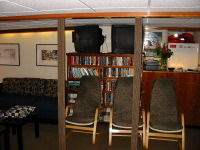 The salon also has the TV's with VCR and DVD players. The VCR was used on this trip to watch some of the complete set of "Sea Hunt" episodes Mike has on tape. They were also used to show video some of the divers took during the trip. There is a good library of reference books for identification and information on sites and wrecks. The Salty Dog bar is also located in the Main Salon. It has adult beverages for after diving. Forward, there is the dining room and buffet service area. The food ranged from good to excellent. One dinner grilled tuna was served, and it was the best tuna I had ever tasted. The food was plentiful, all you wanted at each meal plus in between dive snacks. On the upper deck there is a hot tub, a multipurpose counter with a sink, a refrigerator for guest use where leftovers are put in case you get hungry, and 3 gas grills. 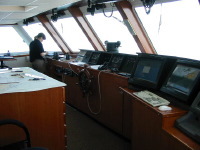 Also on the upper deck are the 2 executive cabins (more money, more room), the captains quarters, and the wheel house. There is a top deck with a pilot station and space for a helicopter. Mary Anne told Mike to not even think about getting a helicopter until after they get a house. It looked like the wheel was just for decoration. There seemed to be enough computing power to run a space shuttle launch (almost). Indeed, the electronics for the ship are state of the art. 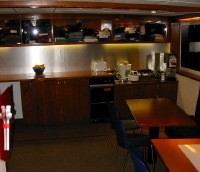 The whole ship is very well maintained and spotlessly clean. This trip was nearly full with 20 divers and one non-diver. The ship still did not feel at all crowded. Since I live in Oregon, and Vancouver BC is only a 6 hour drive North, four of us drove there together. This was the same group I traveled with to Cayman Brac in September 2001 just after 9-11. This time there was much less doubt about our ability to arrive at the port of departure. After meeting at Wayne's house to pack the truck, a Ford F150 crewcab, we managed to leave Salem about 10:00AM. It was a pleasant drive north on I-5. We made it through Seattle without the usual traffic problems, and had only a 2-3 minute stop at the border before passing into Canada. We still had to drive to where is ship was berthed, but the written directions from the trip operator made it easy. We arrived at Steveson, BC around 6:00 PM. We could not board the ship until 8:00 but we were able to drive to the dock and unload our gear. Evidently we were not the first, because there was already a fair sized pile of dive bags on the dock. Airline baggage tags made most of it looked like it had traveled a ways to get there. I felt safe leaving mine along side the large pelican cases already there. Since we could not board the ship yet, and we were hungry, we drove to the nearby long term parking and walked back towards the dock. We stopped to eat dinner at a small Indian restaurant on the way. This made us a get back to the ship about 8:20. It looked like we were last to board. The dive skiff looked almost full. The first thing the rest of the travelers did was to set up their gear on the dive skiff so they could get the station they wanted. That left the forward spots open for us. During dive operations all the spots turned out to be equal, but that night the forward seats did not seem very good because of the way the skiff is loaded on the ship. It is pulled up a ramp at the stern. This causes the stations at the bow of the skiff to have restricted head room. I bumped my head a couple of times setting up my dive gear. Unlike most of the boat diving I have done locally where you have to bring everything, including your own tanks and weights, this trip included tanks and weights, AL 80s and mostly hard weights. I decided to spend a little to upgrade to a steel 100. I was able to drop 15 pounds by using this tank. With the steel tank, I was able to skip wearing a weight belt. I was also glad that I had brought some of my own soft weights. They are more comfortable in an integrated BC. I wanted to dive nitrox on this trip, but due to a misunderstanding between the trip organizer and the dive operator, there was not enough oxygen on board to mix nitrox for all the divers who wanted it. This was a bit disappointing to me, but pretty upsetting to a couple of others. I would have to say this was my only complaint about the trip. I did not think that I had to contact Mike personally to arrange nitrox, but I guess I should have. So now we had all our dive gear set up and it was time to do the paperwork. As a note, Mike highly recommends dive insurance, DAN or equivalent, and requires a Dive Alert. If you do not have a Dive Alert, one will be issued to you for the trip. All the passengers meet in the main salon for a trip briefing. Everyone introduced themselves. As part of the introductions people were asked when was your last dive and how many dives have you logged. I thought that the dive shop owner who was traveling with us had a lot of dives at 1200, but several couples claimed to have over 2000 dives. Since I had been diving for less than 2 years and had about 80 dives, I felt like a beginner. ( I can hear some of you say "You are a beginner") The other divers on the ship came from all over the continent, and one from Hong Kong. There was a group from Kingston Ontario, Ajax Scuba Club . Rick was their unofficial spokesman. He was all kinds of fun. Two other divers whose names I remember were Chris and Don. Chris, from California, gave a slide show one night, the photos were incredible. He said that he and his wife had recently returned from Bali where they had spent a month diving to get a photo of one creature, a kind of seahorse. Don was one of the video guys that shared some of his work. I will mention him more in the first dive of day 4. The introduction briefing is where you hear about what is expected of guests, the operational procedures for the ship, and the important safety notes. Mike stresses proper hydration as a big part of lessening the chances of DCS. To that end, non-alcoholic drinks are available on tap whenever you desire, caffeine is discouraged, and having an adult drink means you have made your last dive of the day. The restrictions on the dives are discussed too. Actually, the only restrictions on the dives was do a safety stop at the end of every dive and dive time. Not because of some artificial reasons but because many/most of the dive sites are tide dependent. You have to dive them on the slack, so you have a predetermined about of time before the current picks back up. On the sites that werenÌt tide dependent, Mike still asked that you limit your dive to usually 60 minutes. I think 60 minutes is a reasonable length of time for a dive in 45f. water. No restrictions were placed on depth of dive or on who you had to dive with. If you wanted to dive solo, that was up to you. Like Mike said, your on your own nickel. I guess people who want to dive cold water and pay for the trip are expected to be responsible for themselves. At least that was what the release said. And now about the diving. In general, the water temperature was a pretty uniform 45f. As I will mention again below, the visibility in Barkley Sound was poor until you got below the plankton bloom, about 55ft or deeper, then it was 15ft to 25ft. The visibility further south near Victoria was better because there was not the bloom to get through. The top side weather was quite varried, but most days were sunny to partly cloudy. Over all, the weather was comfortable. It only drizled on us one day. The Vanlene was one of the last bulk loading cargo ships built before the advent of containerized cargo, so it was obsolete in only a few years. It was sold to a Greek firm and used as a tramp steamer, meaning that it was operated without spending money on maintenance or apparently safety. It was sailing from Japan with load of Dodge Colts. The radar wasn't working and it sailed directly into a rocky island off the west coast of Vancouver Island. It ran aground with the bow above water. The forward gantry crane and deck around it was cut away to allow about 100 of the cars to be salvaged from above the high water line before the ship slid back into the water. The rest of the cars were left in the ship. They are still there in various stages of decomposition. There is a red car in the aft cargo hold that is still intact up to having the sticker on the windshield, but it is a ways back and wreck penetration experience is recommended to see it. We didn't get quite deep enough to see any cars, and I didn't feel safe doing a penetration. This is an actual wreck, quite unlike the Tibbets. The Vanlene is a huge wreck over 440 feet long and running from about 50 feet to over 125 feet deep. Most of the aft is still together. There is much large structure and huge plates and beams, more than you could see on a single dive. I could spend a couple days diving it and not really see all of it. I just wish that some of my photos had turned out good enough to share. Dive 3 -- The Vanlene -- again, this time as a night dive. Still a really cool dive. Not all that much different than the first dive on it because there wasn't that much difference in light levels below the bloom. Dark is dark. I took and used my dive light on every dive in Barkley Sound. Dive 1 -- Meares Bluff -- A pinnacle dive. I felt like a beginner on this dive. Not an impressive display of buoyancy control. I'll do better on the next dive. Dive 2 -- the wreck of the Thiepval -- Mike was embarrassed by this dive. No one ever found the wreck. He thought we were on top of it, but we weren't. It was an OK dive, but not finding the wreck was a bummer. Dive 3 -- Tyler Rock -- The visibility hadn't been that great so Mike decided to move the ship to a different area in hopes of better vis. Tyler Rock once was a dependable site for 6 gill shark sightings. That was until a Canadian research agency decided to us a long line and catch some of them for tagging. After they caught and tagged a few, the sharks seemed to have disappeared from this site. Needless to say, we didn't see any on this dive either. The bloom was still above us so below 60 where the vis opened out it was dark. A daytime night dive. We did see some ratfish egg cases, some rock scallops the size of dinner plates, and a basket star out in the open. 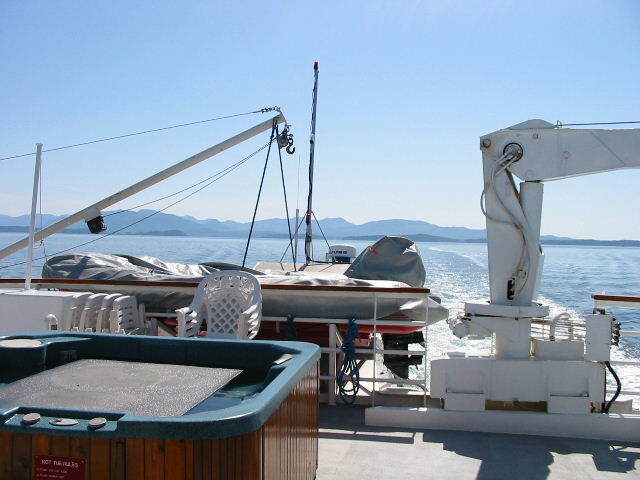 We got the chance to go ashore when we docked in Bamfield, BC. It is a small boardwalk village on the West coast of Vancouver Island, and quite pretty. Dive 1 Renates Reef -- Still had the plankton bloom to deal with. 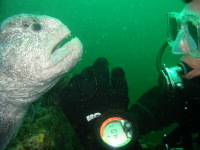 My dive buddy found the wolf eel this time, now we are even. There was quite a variety of invertebrate life of the kind typical of BC diving. ; 3 different kinds of Nudibranches, a white lined dirona, a red flabellina and a pair of really large sea lemon nudies in love. Also saw a very colorful snail, a purple ring top snail. Wish I had photos to show of these, but the conditions for digital photography were not good. Dive 2 -- Renates Reef, again . After this dive Mike decided to head south to Victoria to where he knows the vis will be better. This works out good as there are sites I want to dive there and it makes the ride back to Steveson a bit shorter. It a bit rough sailing going down the coast in the open ocean, but the Nautilus handles it competently. We arrive that night in Victoria. I got up early as usual. I saw by the daily schedule that I had a bit of time to walk around the downtown area. People were offered the choice of doing the morning dive, or touring the city. Victoria is a beautiful city, but I think everyone chose to dive. I must make an effort to return for a stay there. On the way to the dive site, we passed a somewhat larger ship, the Royal Caribbean, the "Radiance of the Seas". I think we were having more fun. Dive 1 -- Ogden Point breakwater -- I'm thinking this is a fairly popular dive site. I've read that it can be done as a shore dive. The briefing included the potential location of wolf eel dens. The site is a steep slope of largish rocks that start from a flat sandy bottom at around 80ft. It slopes up to the breakwater wall, a concrete wall set on the top of large concrete blocks. The large rocks provide lots of habitat for marine life. The vis is indeed much better here so the sunlight penetrates much deeper. I finally don't need my dive light to see everything. There is just so much to see. Lots of fish, such as ling cod, perch, rockfish,and a black eyed goby. 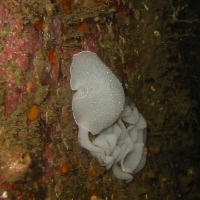 Also several type of nudibranches were found. We were really amused by the swimming scallops. These little guys are about 2-3 inches round. 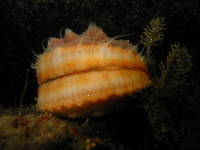 They often have yellow encrusting sponge growing on the top of them. The funny thing about them is that when threatened, they swim away by opening and closing their shell rapidly to shoot a jet of water for a reaction mass. Picture in your mind a pair of those joke false teeth that chatter when you wind them up. You can download the scallop movie here. Please download it to your computer before playing it. Right click or Option click on the link and choose save to disc. The highlight of this dive was when I came across diver Rick. 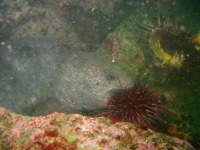 He had coaxed a large male wolf eel out of it's den with a softball sized sea urchin. Wolf eels mate for life and this was the larger, lighter colored male of the pair. This eel, actually a fish, would come right up to Rick's mask and look in his eyes. Or maybe he was seeing his own reflection in the glass. Rick was petting it and looked like he was having the time of his life. I wanted to pet the wolfie too, but I had my camera lanyard on my right wrist. In order to free my hand, I put the camera down on the rock in front of me. I have a Canon A20 in the Canon housing. The housing is clear with some orange trim pieces. I guess the orange was close enough in color to urchin insides for the female wolf eel because the next thing I know she has darted out of the den right at my camera. I was quite surprised to say the least. She discovered quickly that a camera housing isn't the same as urchin. During this, the male decided to go back into the den, so the female took the opportunity to swim around and look things over. She too had a look right into Rick's mask. After about 5 minutes, Rick took out his knife and cut the urchin in half. This got the wolfies excited. They each grabbed half, the male darted back into the den and the female swam off to find her own private place to dine. While all this was happening, 2 other divers with video cameras showed up and caught quite a bit of the action. While I was busy with the wolf eels, dive buddy Mark, who I started and ended the dive with, was taping an octopus out in the open. This dive turned out to be the second of my three favorite dives of the trip. The divers who didn't get to see the wolf eels all expressed an interest in returning to dive it again. After we returned to the Nautilus, we left Victoria harbour to anchor closer to the next dive sites. Dive 2 -- West Race Wall at Race Rocks -- Race rocks is a group of small islands near Victoria. The tides create very fast currents around these rocks, so diving must be done at slack tide. There is a lighthouse on one of the larger rock islands. There were several species of seal lions on another island. Don't want to be down wind of their beaching area. They smell BAD. They are loud, too. We hoped to see some in the water on the dive, but they were more interested in sunning themselves. The dive itself was pretty nice. There was quite a bit of kelp for habitat and lots of rockfish. I ended the dive with a wet right arm, first time I have had my wrist seal leak on my Mobby's drysuit. Must have been operator error. I couldn't find a hole and my arm stayed dry the rest of the trip. Dive 3 -- the Wreck of the Bernard Kastle -- The ship was built in 1870's. It was over 260 feet in length and was carrying coal when it sunk. There wasn't a great deal left to see and the visibility wasn't super. Mike did say this this wasn't one of the "signature" dives in the area. I did manage to pick up a bit of coal. Now it is approaching time for a night dive. I had talked to some other divers and we agreed that Ogden Point would be a cool night dive. Maybe get a chance to see the octopus. Mike had other ideas for the night dive. Dive 4 -- The Great Race at Race Rocks -- Since we were making this dive at the mercy of the Slack Tide Gods, this dive time was limited to 40 minutes, the shortest of the trip. The site was a 40ft deep channel that ran between the island with the lighthouse and the island of the stinky seal lions. This was a twilight dive. We got in near dusk and when we got out it was near dark. We entered the water about the center of the channel and went with the current along the bottom. Never has I seen such colors. The bottom was covered with whites, pinks, reds and purples of mostly invertebrate marine life. It was just so cool to be flying over this while dive buddy Mark was video-ing. We each had these unbelievable lights for the video. I don't recall the exact name, but I think they were Underwater Kinetics. They were brighter than the light cannon and there was no hot spot, just a whole bunch of wide, even illumination. He had borrowed them from a friend. I was impressed with them and asked the cost, around $350, each. The battery in the one I was holding ran out just as were got to the end of the channel, so I went to my primary light, an UK C-8. It looked dim in comparison. It was about then the current turned and were started back the other way. I would have liked to go back through the whole channel again, but time was up, so we did our open water safety stop then surfaced to be picked up by the skiff. This dive was number 3 of my three favorite dives. After we were back on the Nautilus, Mike asked me if I was glad I had gone on the dive. I didn't have to answer, he could tell my the smile on my face it was a great dive. After we got back aboard the Nautilus, Mike pulled anchor to go back to Victoria to tie up for the night. The schedule called for one dive tomorrow, I was hoping it is either the McKenzie or the Church, then sail for home. The plan for today is: breakfast, dive briefing, then a ride in the skiff out to Ogden Point again so the rest of the divers have a chance to see the wolf eels. I was hoping for a chance to dive the Church and the McKenzie, 2 artificial reefs, but . . . . I guess that will have to wait until another time. Dive 1 -- Ogden Point breakwater -- Since I had such a great experience with the wolf eels last dive here, I decided to let others has a chance. I chose to spend this dive trying to get a good photo of some of the nudibranches. I was disappointed with the results. Most of the photos weren't sharply in focus. The background was in focus, but the subject was fuzzy. Looks like more practice with the macro setting will be needed. It was still a fun dive. Too bad for the other divers who wanted to see the wolfies, they didn't want to come out of their den this time. Only 1 dive this day. The Nautilus has come out from the harbour to pick up the skiff after all the divers are on board. Once we were back on the Nautilus, the crew hauled the skiff up the ramp and we started for home. During ride back to Steveson, people took apart their gear and got it washed up. 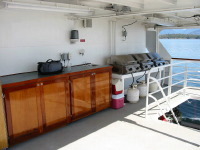 There was ample space on the upper deck to spread out wet stuff to dry before you had to pack it up. This was also the time for the video people to look over their stuff and trade the best parts. Dive buddy Mark loaned me his copy of the video. As soon as I can borrow a friend's digital video recorder, I will be able to start editing. It seemed like a longer ride to go home even though it was probably a shorter time than the trip up. I didn't get home until 11:45 PM. The dive gear would have to wait until the next day before it got unloaded. I would highly recommend a trip aboard the Nautilus Explorer to anyone with an interest in cold water diving because there just isn't an easier or more comfortable way to do it. The crew was great. They were knowledgeable, very helpful, safety conscious, and fun.